June 29 was a 90–100-degree day, so Walter and I started out dressed lightly and hauling plenty of Vitamin Water in the cooler. As we moved from location to location, the heat kept coming, but we forged on, determined to complete our day-long photo marathon! As you can see below, the project was truly a joint venture. 5:45 AM. catching the sunrise from Rt. 109. Photographing Sandra Scott in the Millis Library Friends Room. 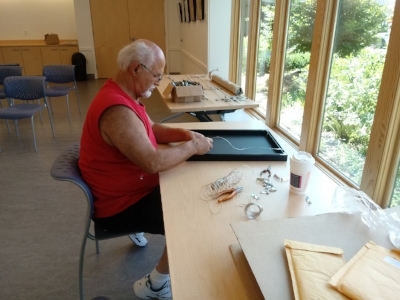 Walter Anderson attaching wires to the frames. Walter Anderson attaching wires to the frames (detail). Framed photographs, before being mounted on the wall. Framed photographs on the wall, befoe straightening.